Launched at the 1959 earls court motor show in london, the aston martin db4 gt was a short-chassis development of the all-new db4 introduced the year before. Strictly a two-seater, it was distinguished by streamlined light-alloy touring superleggera bodywork and faired-in headlights. Four-wheel disc brakes were a feature inherited from the marques racing cars. Its 302hp engine was more powerful than most grand prix cars of the day. Top speed of 154 mph engine typedrivetrain: Water-cooled, double-overhead-cam, light-alloy, 6-cylinder displacement 3,670 cc (3.67 l) power rating 314 hp transmission 4-speed manual chassis: Separate steel platform; Rack-and-pinion steering; Front independent suspension by coil and wishbone; Rear suspension by coil-spring trailing arm with watts linkage; 4-wheel disc brakes; 2,662 lbs. Light and powerful in i960 came the ultimate development of the db4 gt, a joint venture between aston martin and carrozzeria zagato of milan. Its voluptuous body was some 100 lbs. Lighter than the touring two-seater, and its engine was even more powerful its standard tune was 314 hp. 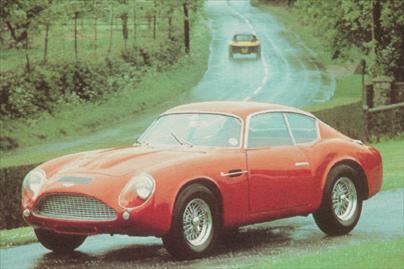 Zagato built just 19 db4 gts (out of a total of 75 cars); Two were lighter racing models. searing performance leading drivers such as stirling moss, roy salvadori and jim clark raced zagato astons, which in the period between i960 and 62 presented a serious challenge to the ferrari 250 gto. On the road, the zagato aston martins competed in many sports-car races and, in 1961, took the team prize in the rac tourist trophy. The zagato-bodied db4 gtwas among the most desirable of all aston martins, a thoroughbred equally at home on road and track.